Maybe they were a wedding gift from a relative who loves to cook, or maybe you splurged with a bonus for work. However you obtained them, that shiny new knife set sitting in the knife block on your counter probably makes you feel like you can conquer anything your cookbooks throw at you. A couple months (or years) down the road, however, they’re a little less thrilling. Not only has the exciting new-ness worn off, but that keenly sharp edge they came with has worn down, and chopping onions isn’t the quick and easy task it used to be. What many people don’t realize is that your knives need regular TLC in order to keep that nice, sharp edge they are sold with. If you got your knives in a nice set, complete with wooden storage block, they may have come with a round metal stick that looks a bit like a very high-grit file. This is called a honing steel, and can be used to help your knives cut better, but that’s still not enough to truly keep your knives sharp. Always clean and put it away after use – This means no leaving it in the sink to soak! 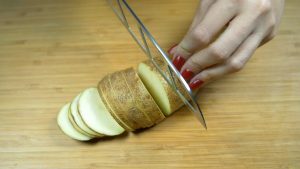 Not only do you risk slicing your finger open if you drop a knife to soak with the rest of your dishes, but you also run the risk of seriously damaging the blade. A knife that’s left to hang out in a sink full of dishes can get scratched, the blade can be dinged, or the tip could bend or break off. All of this will wear down your knife more quickly. Store it safely – And, by safe storage, we primarily mean it should be stored somewhere by itself. That’s why they sell those knife sets with the wooden block full of slots. Storing a knife in with the rest of your utensils is pretty much begging for the blade to get dinged, scratched, or bent just from being tossed around with your silverware. If you don’t have anywhere else to store your knives, invest in a knife sheath for each of your knives, to protect the blade. Hand wash only – No matter how well you think you’ve placed a knife in your dishwasher, no matter how far away from all the other dishes and utensils, your dishwasher is still not a safe place for your knife. The force of the water will batter it around and, you guessed it, damage the blade, making it dull faster. Wash it by hand, dry it, and immediately put it away. Always use cutting boards – When you upgraded your countertops, the salesperson probably told you that you could do anything on those granite counters, including chopping. Sure, you can chop without worrying about damaging your counters, but what about your knives? Counters and even dishes are too hard and will dull your blade quickly, so always be sure to use a cutting board—and wood is the softest, so it will dull your knives the least. Unfortunately, even the most fastidious care won’t entirely protect your knives from dulling. If you want to keep your quality kitchen knives sharp and in good condition, you’ll need to sharpen them occasionally. The long steel stick that comes with many knife sets, the honing steel, is a good first step. However, despite what many think, the honing steel doesn’t actually sharpen your knife! All it actually does is help push the edge of your blade back to center. In order to actually keep the edge sharp, you will need to get a knife stone or send your knives to a professional sharpener. 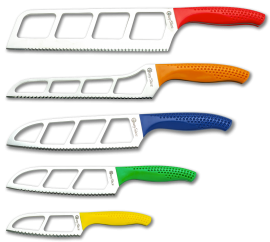 Or, if you’d rather have knives that aren’t so high-maintenance and still stay sharp and easy to cut with, shop Easy Cut knives! The double scallop edge to our blades means you can cut basically anything easily and straight—and our knives don’t need sharpening! 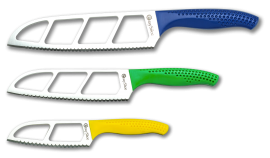 Shop our no-sharpening knife options online to experience the difference for yourself!